One thing that is great about AutoCAD is that it will tell you if something worked or didn’t work. One way it does this is by showing little pop-up notifications in the lower right hand corner of your screen. The annoying thing about these pop-ups is that they don’t close on their own. They wait for you to click on them in order to close. 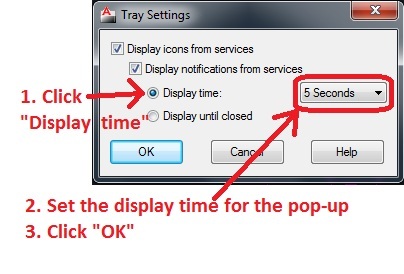 Here is how to set these pop-ups to close after a given amount of time. 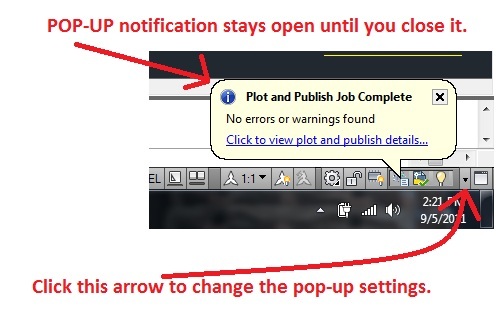 The picture below shows what the pop-up notification looks like when you print/plot a sheet. 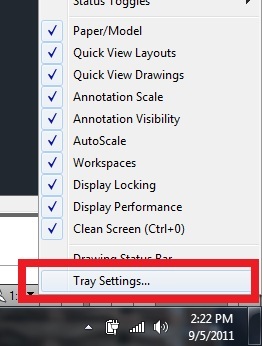 After clicking on the arrow, click on “Tray settings” at the bottom of the list. The next time you print or get a notification, it will close itself after the amount of time that you specify. This entry was posted in Customization, Settling In, TIPS. Bookmark the permalink.